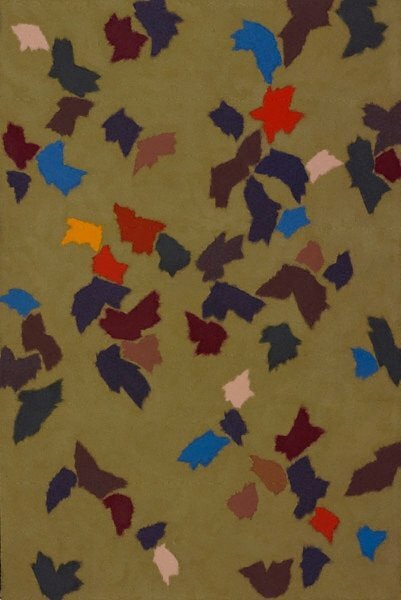 This painting exemplifies Aspden’s deft placement of shapes and musical ‘accenting’ of colour to create movement on the surface of the canvas, as well as interplay between foreground and background. One of a series of Meditation paintings and drawings made at this time, it marked a new development in his work in which he arranged his signature free-form shapes more loosely over the canvas in what was termed a ‘floating’ style. Nancy Borlase., The Sydney Morning Herald , 'A reminder of the goodness of good art', Sydney, 24 Sep 1977. Rudi Krausmann, Aspect: Art and Literature , 'David Aspden' interviewed, pg. 19-29, Mona Vale, 1979, 23 (illus.). Sandra McGrath., The Australian , 'Less urgent', Sydney, 21 Sep 1977. W.E. Pidgeon., Sunday telegraph , 'A change in meaning', Sydney, 02 Oct 1977. Helen Campbell with Eric Riddler, David Aspden: the colour of music and place , 'Chronology', pg. 79-85, Sydney, 2011, 36 (caption), 37 (colour illus. ), 82, 88.